Robert L. “Bob” Rasmussen (born May 26, 1930 in Rio Vista, California), is a noted military artist; a retired Captain of the United States Navy; a former career naval aviator, primarily in the F-8 Crusader; a former member of the U.S. Navy Flight Demonstration Squadron, the Blue Angels, and Director of the National Naval Aviation Museum at NAS Pensacola, Florida. His Vietnam war experiences, including surviving the fire aboard USS Oriskany, have been documented in several books. A prolific artist, Rasmussen has created hundreds of Naval Aviation paintings in watercolor, oil and acrylic. 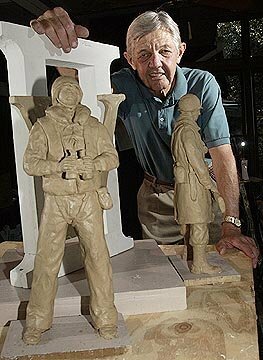 His bronze sculptures include the design of the Spirit of Naval Aviation, displayed at the front entrance of the National Museum of Naval Aviation, Pensacola, Florida, the Alan Shepard memorial heroic figure  at the Astronaut Hall of Fame, and the World War II and Korean War memorials in Pensacola, Florida. His works have been displayed around the country, including the National Air and Space Museum in Washington, D.C., the National Naval Aviation Museum in Pensacola, Florida, and the NASA Museum at Cape Canaveral, Florida. Rasmussen is the recipient of the R.G. Smith Award for Excellence in Naval Aviation Art, was inducted into the Naval Aviation Hall of Honor in 2008, and was awarded the Navy Superior Civilian Service Award on 24 September 2009.